It's been weeks since I have been able to get to my art work, but tonight I finally got to to class again for the first time in over a month. I'm just home from a cruise to the Bahamas which is how I managed to miss two classes, LOL. I was hoping to get a bunch of great reference photos to be able to do a Bahamas series of paintings, but for various reasons didn't get many at all. Mainly as I was only in Nassau and I was hoping for more landscapey type shots, not city shots. But our trip to Half Moon Cay, where I had hoped to get the nature shots, got cancelled because of problems with the ship. But I have a small number of photos that *might* make paintings, so I could still have a small series I suppose. This is the first one I tried to work with. The water truly was that amazing blue color you see in all the travel literature. I loved it. 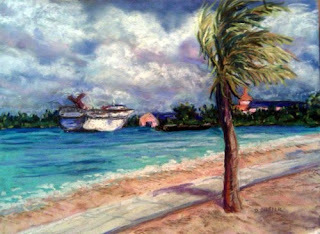 This was done on a 9x12 sheet of Wallis paper - various pastels.